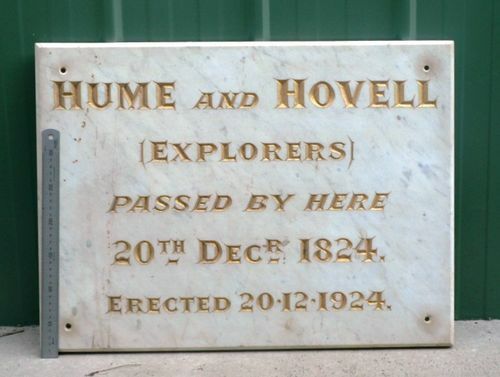 Plaque commemorates the Hume and Hovell expedition which passed through the area in 1924. The plaque was originally hung in the Hansonville School, (corner of School Road and Banksdale Road, Hansonville), near the Hansonville Hall, at the Hansonville Reserve. The Hansonville School was closed in 1993, merging with the Greta South School to become Greta Valley, at the Greta South site. The majority of the Hansonville School buildings were later removed or demolished. After the 1952 bushfires, when the Hansonville Hall was destroyed, the nearby Greta Hall was moved to its current location on Reserve Road, where it was renamed the Greta-Hansonville Hall. It is planned to house the original tablet there, and to erect a commemorative stone with a brass plaque at the original site.